Gillian Welch And David Rawlings Beat Back Writer's Block The folk singers discuss their complementary singing voices, and a brand-new album that took eight years to complete. 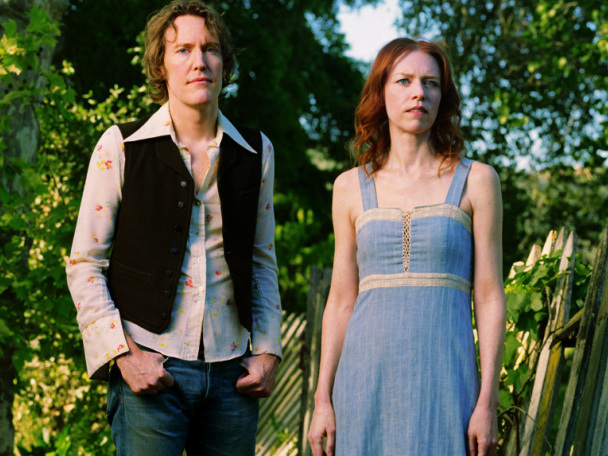 The Harrow and the Harvest, Gillian Welch's new album with David Rawlings, is the duo's first since 2003's Soul Journey. It's been a long time coming — eight years actually — but it's finally here: a new album from Gillian Welch, one of the country's leading roots-music artists. The album is called The Harrow and the Harvest, and it's another collaboration between Welch and her longtime partner David Rawlings. The story of Welch and Rawlings seems almost too serendipitous. They met when they were both attending the Berklee College of Music, and since then they've established their sound as much by lucky discoveries as conscious choices. Welch tells Weekend Edition Sunday guest host John Ydstie that she remembers clearly the first time she and Rawlings ever sang together. "We'd sung with a lot of people before that," Welch says. "But there was some particular way that our voices hooked up that was reminiscent of sibling harmony — The Dilmore Brothers, The Monroe Brothers, The Stanley Brothers — that certain something that you can't manufacture. Two voices either have it or they don't. I like to think we've cultivated it over the years." On their latest album, it's difficult to parse who's singing what part. The new sound didn't come easy — Welch says that during their eight years away from the studio, they reached a point where they thought they might never make another record. In the end, though, she says all that trying made their partnership even stronger. "It's a little annoying sometimes that Dave is capable of working so rapidly," Welch says. "Whereas my process is more intuitive: [I have to let] stuff in my gray matter bubble to the surface. I'll spend a six-hour night working on something and then Dave will come up with a missing line while he's brushing his teeth. But it takes that balance in our work. I really don't begrudge it at this point. "I'm just so happy to be a part of an actual songwriting team," she adds. "It seems very rare these days."